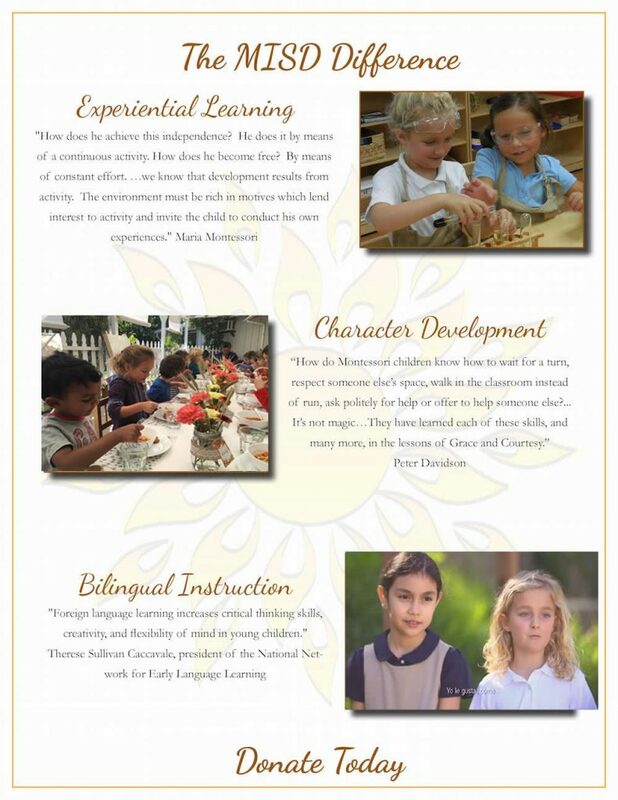 The Montessori Institute of San Diego Children’s House and Arts & Sciences Elementary were created to serve as model schools for MISD Teachers-in-Training. We do not cut corners and we do not compromise. MISD Families who donate to the Annual Campaign are the heroes who make this commitment to excellence possible. $250-$500: Fund Staff Holiday Bonuses. Great schools depend on great teachers. Teachers who have the gift-giving virtue, the knowledge, and the creativity to lead a world-class Montessori classroom. San Diego is a very expensive place to live. Your donation will help make it possible for our world-class staff to survive, and thrive, in San Diego! $500-$1000: Help Close the Gap between Tuition & the Cost of Giving your Child an Authentic Montessori Education. MISD is committed to keeping tuition reasonable and to making a Montessori Education accessible to all familes. We keep tuitions lower than local La Jolla schools and we provide 15% of MISD families with scholarships. Your donation at this level will help us maintain these commitments. $1000-$25,000 Supporter-Benefactor-Patron: Invest in the Future! Children are our best investment, and your family can be the catalyst that sparks a community-wide renaissance: “The Lifecycle Benefits of an Influential Early Childhood Program” Professor Heckman and his colleagues at the University of Chicago and University of Southern California Schaeffer Center released new research that presented a 13% ROI on early childhood programs. Thank you to the 40 Families who have honated to the 2016 Annual Campaign! And to all the families who are planning to donate before Jan 31! We cannot do it without you.